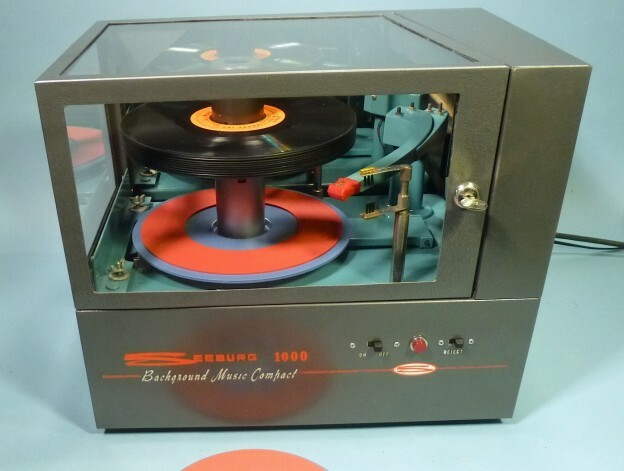 Seeburg 1000 players employ special 9″ records with 2.5″ center holes. The device plays both sides of each record, then lifts the stack to the top of the spindle for replay. Seeburg BMS (background music systems) were In widespread use in department stores, restaurants, and other retail and industrial locations from the early 60’s through the late 70’s. They have become very popular mid-century modern artifacts. The thousands of music selections were individually crafted by professional musicians and studios, and are utterly representative of a unique and often forgotten part of American culture. The 16 rpm records are widely available on ebay. This is my 4th complete restoration of a Seeburg 1000 player. Thanks for watching! This entry was posted in Restoration/Repurpose Vintage Gear and tagged background music, jukebox, seeburg 1000, txsound, verrando on November 18, 2014 by pete verrando. Sennheiser T-power upgrade to 48 volt phantom is here.